A group of anti-ICE protesters Market Street at 9th heading towards City Hall on Friday morning after blocking traffic at 8th and Cherry Streets. 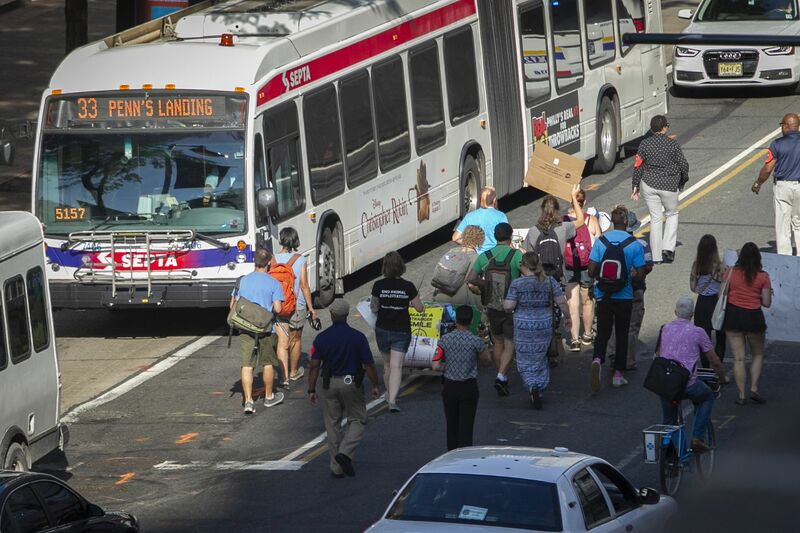 Anti-ICE protesters briefly blocked traffic during the morning rush hour Friday at Eighth and Cherry Streets near Police Headquarters in Center City. It is the second time this week protesters have blocked traffic at the corner, where the Immigration and Customs Enforcement agency's Philadelphia office also is located. In Friday's protest, about 20 activists blocked traffic for about half an hour, banging plastic drums and chanting slogans, before marching to City Hall, where an Occupy ICE encampment has been in place since July 6. On Wednesday, about two dozen people staged a similar protest before weaving through streets in Chinatown on their way to City Hall.